We are having a wrought iron (really steel) fence installed along the front of our property, so Marc is clearing out a path for the workers. He came across this mourning dove in a nest with her babies. He left her cactus standing, in hopes that the babies will be able to move by the time they reach that portion of the fence. Thatis just a piece of shell in the photo. 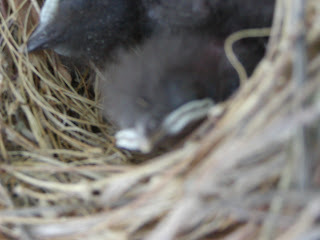 Since I was photographing the first nest, I went around and started taking pictures of other nests. 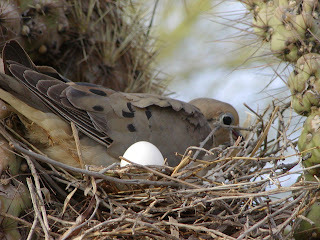 The mourning doves have small shallow nests made out of twigs. 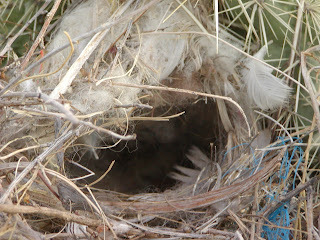 The above nest belongs to a cactus wren. 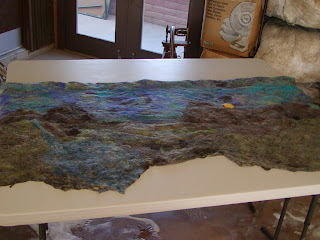 She used geese feathers and wool to line her nest. I found two nests like this one. These are baby thrashers. Their mother was in a palo verde nearby and started squawking. The babies lifted their heads in response. The camera was too slow to catch it, but these little black birds had yellow sacks on their necks. Really weird looking. Their nests are similar to the mourning dove nests, but deeper and slightly bigger. No feathers or wool for them! 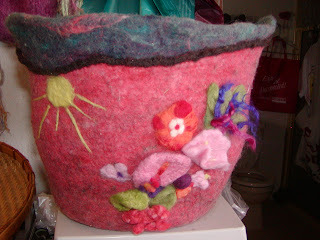 A friend came over and asked me to help her felt a wall hanging for her kitchen. At one point, we measured it and it was 40 by 96 inches. It shrunk, but was still a huge piece. 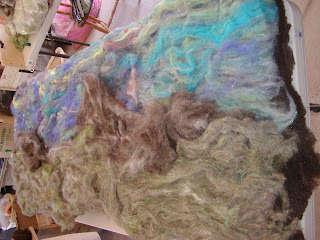 This is one third of it before felting. This is a side view of the whole piece. Gorgeous! A view after the landscape was soaked in water and soap. 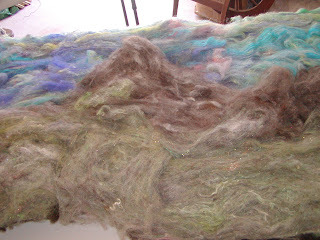 A close up view of a small portion once the felting was completed. 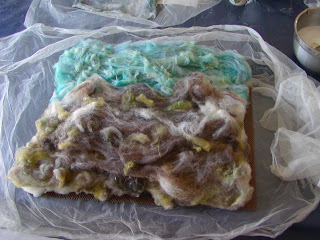 She plans to add horses and other elements with needlefelting. She has a vision! 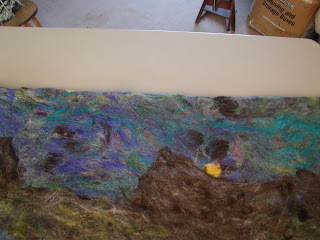 The above is a landscape that a young girl felted on Saturday. I forgot to get a finished picture, so hope she will send one. 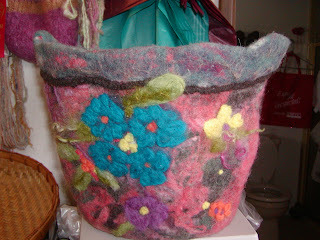 Anna Zavala felted the bowl with intentions of turning it into a purse. As it sat on her table, she was slowly inspired to turn it into a bowl. The above is our favorite side which she made after completing the side shown in the photo below. Skeins of yarn hanging to dry. They are the flower inspired series. 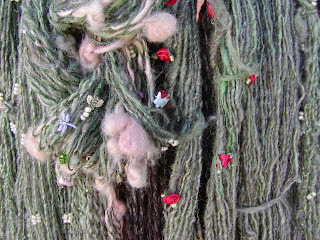 The red things are satin flowers found in the wedding section of craft stores that I spun directly into the yarn.